The quality of your area rug and the way it looks and feels is not only determined by its fiber, texture and color, but also depends on how your area rug is constructed. Performance value and cost can be determined on whether your area rug is machine-made or handmade. Machine-made area rugs are available in both natural and synthetic fibers while their counterparts handmade area rugs are constructed from using natural materials. Here is a quick overview. 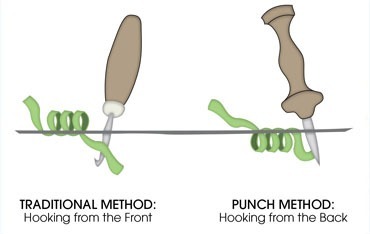 Weaving in which no knots are used. 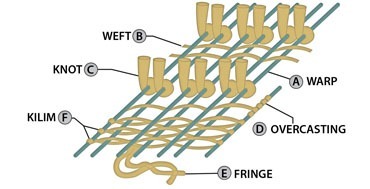 The weft strands are simply passed through the warp strands. Dhurries are flatwoven area rugs that originated in India and are usually made of cotton or wool. Kilims are generally finer, tapestry-like flatweaves. In creating a hooked area rug, a canvas cloth is first attached to a frame. Using a hooking instrument or device and following the pattern, the weaver punches the yarn up through the canvas, creating a looped pile. Next the area rug is taken off the frame and a layer of latex glue is spread over the back of the area rug. This is necessary to hold the yarns in place, as they have not been knotted or tied into the foundation of the area rug. It is important to note that the long ends of wool that often appear on the surface of the hooked area rug (called sprouts) must not be pulled for this very reason. If they are pulled, versus cutting them even with the pile, it will result in a section of missing wool and will damage the area rug. After applying the glue, a cloth is attached to further protect the back of the area rug. Lastly, the edges of the canvas are turned under and stitched. 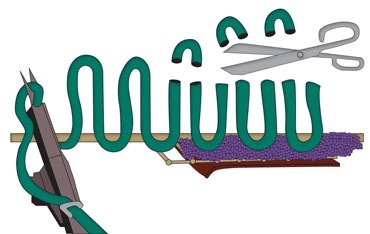 The quality and durability of hooked area rugs vary, but it is mostly based on the point size; the smaller the loop the better. Gross point is the largest loop size and is used for a more detailed design. Hand-tufted area rugs are created in a very similar fashion to hand-hooked area rugs. The major difference is that after the loop pile is created, it is usually sheared to produce a flat pile surface. As the name implies, this type of area rug is produced by craftsmen who draw the design on the canvas which will become the area rug anchor backing. These craftsmen then tuft the area rug using a “tufting gun” to insert various colored yarns into a backing. Area rugs manufactured in this manner may be either “cut”, “loop”, or “cut and loop” finish, and varying pile heights may be used within the area rug to achieve a textured effect. Hand-tufted area rugs are among the most sumptuous types of area rugs made, offering infinite design opportunities and variations. Those area rugs woven either on a hand, or a hand and foot power-loom. To determine if the area rug is hand-woven, look at the back of the area rug near the fringe. If the ridges run parallel, the area rug is hand-woven. Area rugs made by weavers who knot pile yarns around the warp fibers that run the length of the area rug. Generally, the more knots per square inch, the more valuable the area rug. Hand-knotting is the most labor-intensive of all area rug-making. An area rug made by large power-looms. 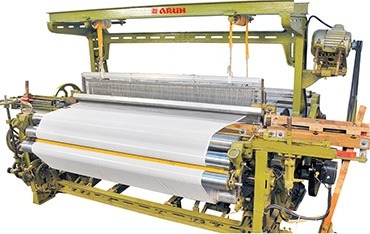 A power-loom is electrically automated and controlled by computers. Machine-made area rugs can be made quickly and can be offered at a lower price compared to handmade area rugs.